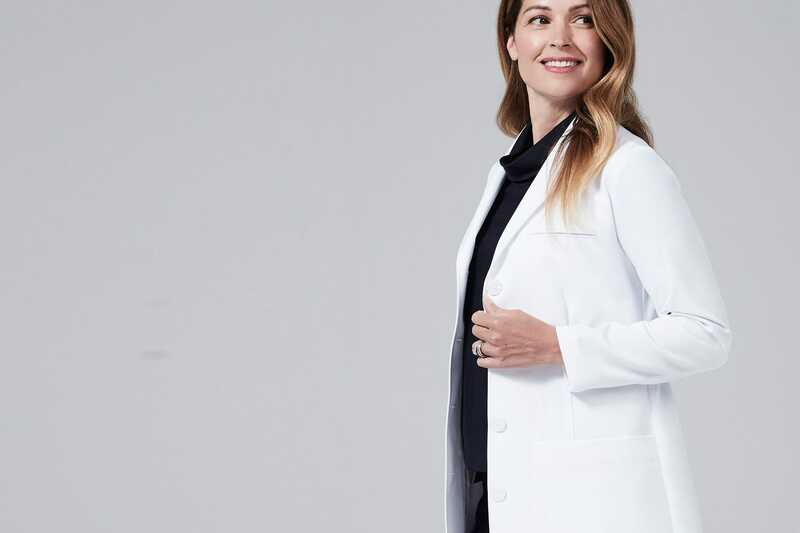 A fresh and sophisticated shawl collar women's lab coat, loose back belt with buttons, beautiful finishing, and reliable fabric protection are all in service of a fitted style you'll be happy to wear each day. I love my Emma Classic Fit white coat. It fits like no other coat I've worn before, it's feminine and professional. The most flattering white coat ever. Signature shawl collar and back belt. 2 patch pockets that can fit modern tablets, 1 chest welt pocket and 1 interior. Back vent for a tailored, refined look. Princess seams for a graceful silhouette. Love the soft fabric and the female fit. Definitely the best coat in my 16 yrs of practice. The white coat is exactly as described and it truly does repel liquids as I tried to rush the other morning, spilled my drink & it ran right off of the sleeve. Great purchase - I would buy again. So professional and amazing. I get a ton of compliments. I feel comfortable and look great. I am 5'3" around 130 lbs, the white coat fits me amazing, and is not too long. The fit around the waist is definitely tailored to a woman, so it is not boxy. It is very flattering, unlike the cheap ones you find at uniform stores. I originally ordered coats in size 2 and size 4 thinking I would fit one of the two, and found that the size 2 was way too big for me, and had to exchange them for size 0 which fits perfect, and is still roomy. My new jackets look and feel great. I already spilled coffee on one and it wiped right off. I also get many compliments thwm. Just bought what is probably my 20th coat for our Aesthetic Practice. When it arrived damaged we had a new one in less than a week! I really believes it makes our clinical staff look polished and professional. Q: Does the Emma W lab coat have cut outs on the sides? A: Thank you for your question. The Emma does not have side slits. The only Women's coat that offers the side slits is the M3 Ellody Petite lab coat. Q: 1. Can you exchange products that you've had embroidered? If not, how do I go about embroidery if I'm not sure which coat/size I want. 2. What are the average lengths of your female lab coats in size 6. Thank you fro submitting your question. Unfortunately we are unable to accept any returns on orders that have been personalized like name and title and logo embroidery. We always suggest that you make a purchase without embroidery for a few different styles and sizes without embroidery. We do provide free returns and exchanges for orders in the continental US. Once you have decided your size you can send your items back for embroidery, exchange or refund. Our size 6 lab coats range in lengths from 34 inches long to 36.5 inches long. Our shortest lab coat is our Ellody Petite which is 33.5 long. If you have any additional questions do not hesitate to reach out to us at 877.987.7979. Q: Hi. I am 5'3", weigh 140Ibs. My bust is 34DDD. I really like the Vera G fit but it seems like that style may not flatter my body. I am top heavy, waist is significantly smaller that my chest. What style would you recommend? Thank you for submitting your question. I am happy to help get you in to the right size and style. The Vera G lab coat is a beautiful slim fit coat. It is actually known to be roomy in the shoulders and the bust area, not so constricted as others. I would suggest you try the Vera G lab coat before passing this style up. You mentioned that you are top heavy, so I am assuming your slender from your torso down. The Vera is slimming in the torso and will be a very flattering fit. If you are looking to stray away from a slim fit, I would suggest the M3 Emma. The M3 Emma is a classic fit lab coat, which provides a bit extra room in the torso area. The M3 Emma has a very feminine and flattering loose back belt that gives the illusion of a tapered coat. This style is roomy and comfortable with a very feminine but classic style and touch. If you are in the US, we do cover all shipping expenses on our orders over $100 and complimentary returns and exchanges on all orders. I would suggest you take advantage of this offer and try these styles and sizes so you can really determine your true style and size. If you have any questions or need any help placing your order, do not hesitate to reach out to our Customer Experience Team between the hours of 6:30 am - 5:00 pm PST, Monday through Friday at 877.987.7979. Q: If I'm ordering two sizes to try at home, do I pay for the embroidery now or I wait until I return the lab coats with instructions? A: Great question! Definitely wait until you make your return request and a member of our team will assist you with the exchange. Q: I love my Emma lab coat - it has worn very well over the past 3 years. Has the sizing of the new M3 Emma changed from the original coat? Should I order the same size? A: Thank you so much for your question! If you purchased the Emma W. 3 years ago you should be ok to purchase the same size if it fit correctly. Just keep in mind that the new fabric does not shrink the arms like the 100% cotton fabric did before. I would highly suggest ordering two sizes if you're really unsure and try them on at home - then return for embroidery and keep the size you like best. Please get in touch with us at contact.us@medelita.com or call us for more information! Q: When are the size 18 lab coats coming? Some of us are middle-aged providers with bellies! Also, what do you mean by "improved sizing"? My old size 16 Emma W. Is perfect (well, except maybe a bit short--I like the length of my Estie better (I'm 5'7", 225) but can't button the Estie--no belly room there. A: Hi there! Thank you for your question. I can completely understand how frustrating this is. Rest assured that we are absolutely working as fast as possible to provide more styles and sizes because we know how important it is to have the right fit! We are exploring some creative ways to introduce more sizes sooner (limited runs, crowdsourcing maybe? ), but at this time we're unable to add this to this year's supply - mostly due to the fact that we don't have the option to produce a small number of these sizes each run and there just aren't enough orders for other sizes to justify moving production away from our current sizes. That said, as we continue to grow, we fully expect to be able to offer more and we're excited for the future. You will definitely know when this happens - in the meantime please help us get there by telling your colleagues about Medelita! Thanks so much. Q: is this lab coat iPad compatible?